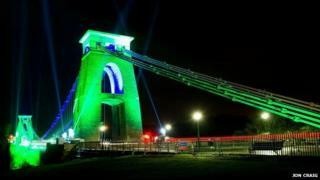 Bristol has marked the start of its year as European Green Capital by lighting up Clifton Suspension Bridge. The bridge was lit with green light at midnight. The city is the first in the UK to be given the status since the award was launched in 2008 and has taken over the title from Copenhagen. The initiative rewards cities making efforts to improve the urban environment and create healthier and more sustainable living areas. Previous title holders are: Stockholm in 2010, Hamburg in 2011, Vitoria-Gasteiz in 2012, Nantes in 2013 and Copenhagen in 2014. Ljubljana, in Slovenia, will take over from Bristol in 2016.